One thing we are very proud of here at American Profit Recovery is our educated team. No, not everyone has PhD here, but every one of our staff understands their job, the collection industry and their role in helping both business and consumer. If our team members are not off site keeping up to date on everything we need to understand in the collection industry, we are always reinforcing best practices here in our office. In fact, it’s a daily occurrence. Education is part of our culture and that makes American Profit Recovery a great place to work and one of the best collection agencies for a small business to use. Because we believe so much in education, our team participates in the annual Collector’s Challenge. 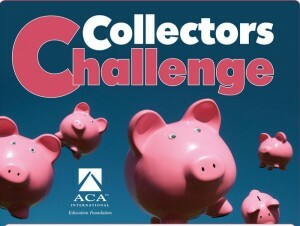 Spearheaded by the ACA International Education Foundation, the Collectors Challenge helps raise funds to assist in the advance of education for those in or affiliated with the collection industry. The Foundation offers the annual Loomer-Mortenson Scholarships as a result of funds raised through the annual Collectors Challenge held each April. This year, our team raised over $1,500 for the Foundation. That brings our ten year total to over $17,000. And each year, we raise it by having fun in the office. We have fun here anyway but we bring up another level when we are raising money for great causes. Our team participated in putting contests, our March Madness brackets, and of course everyone pays to dress casual in the office. New this year was our paper airplane contest. 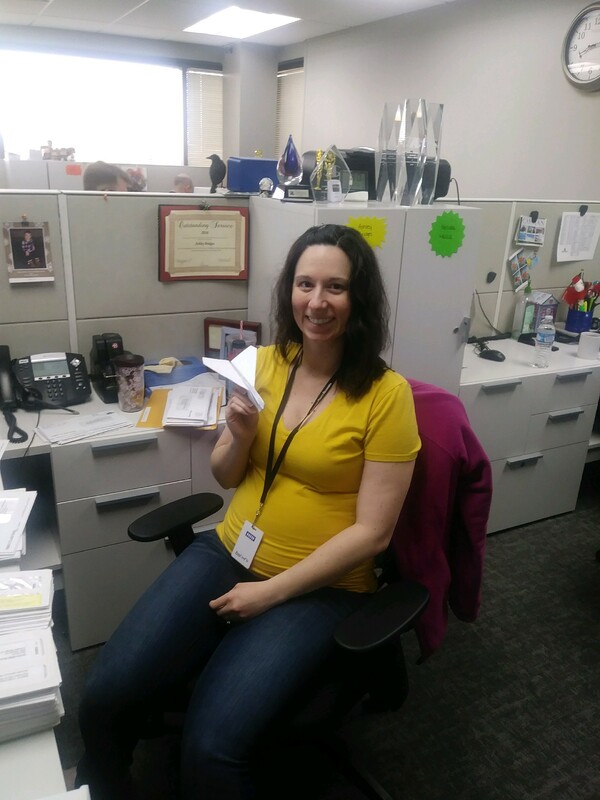 Team members could pay for a piece of card stock they then turned into a paper airplane. The airplane that went the most distance earned that staff member an Amazon gift card. Stay tuned to our Facebook page and our blog to see where our team ends up next to raise money and help others. The Holiday season here at American Profit Recovery brings one of our favorite holiday traditions! Each year the American Profit Recovery employees take part in local “Adopt a Family” programs to bring gifts, clothes and needed items for the holidays to families in need. This year our team raised over $1,300 and purchased over 200 gifts for two local families and over 100 gifts for a local foster group home for girls. We generally get lists starting in mid-November of items in need and then we fundraise several different ways each year in the office to get the funds and gifts for the families. 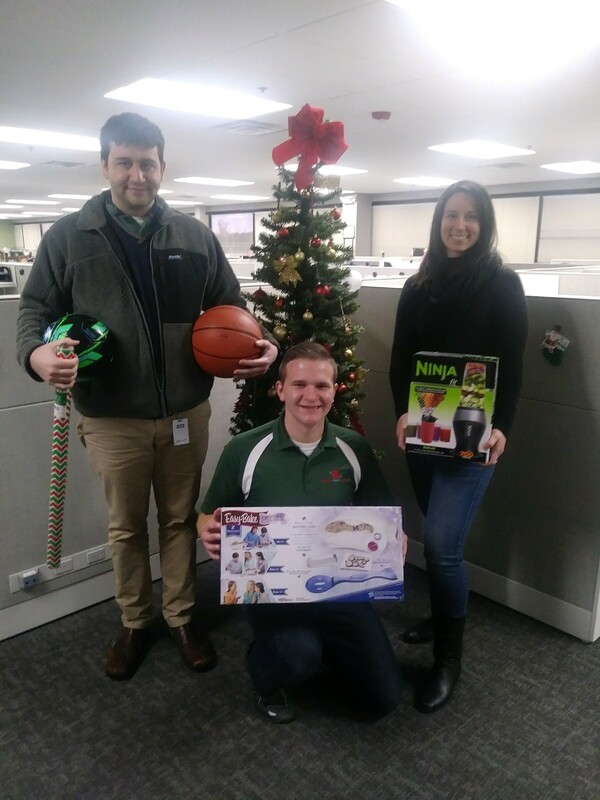 This year we gave the employees an option to buy casual dress days, participate in a football game, and also gave them the option of purchasing gifts off our “Giving Tree”. Several employees also donated their time by shopping for all the gifts and delivering the gifts to the different locations. Giving back is part of our culture here at American Profit Recovery and one of the most important values our team member possesses. And it shows every time we get together to help others. Happy Holidays from everyone here at APR! We have a brand new office here at American Profit Recovery. New walls, desks, chairs, conference rooms and new phones. Everything here looks great at this collection agency. So why did our staff spend the summer in jeans? We were raising money for charity of course! Every summer we run our annual Summer Charities of Choice program where we raise money for a bunch of nonprofit organizations. And we raise the bulk of our funds by paying for the option to dress casual in the office. We conduct a number of other activities to have fun and raise money but most of the cash is raised by dressing casual. What’s different about this charitable initiative is that it is spearheaded by our staff. All the charities we send money to are nominated by our team members. This year our team raised close to $3,000 by dressing in jeans and a few other funs activities during our Employee Week. Each year our staff is asked to nominate and select charities we want to raise money for. And they have picked charities in a wide range of service offerings. From local sports organizations, cancer charities and other worthy causes, our team has been responsible for raising close to $20,000 over the past several summers for some great organizations. Here is a list of the charities we are sending checks to this week. All nominated by our dedicated staff! 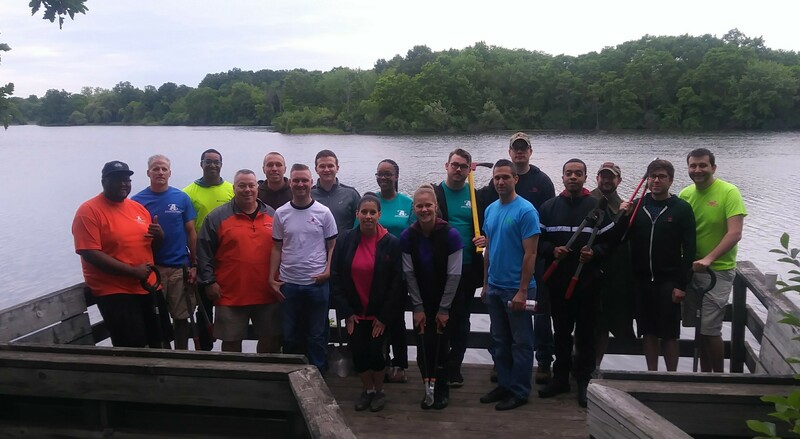 Many hands make light work—it may sound cliché, but the employees of American Profit Recovery prove it to be true every year at our annual Adopt-a-Park Outing. 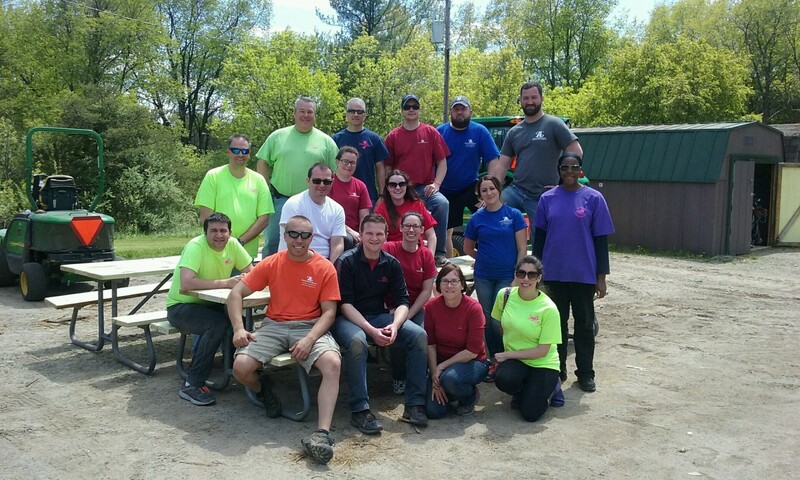 This year, the employees and owners of this collection agency descended on Island Park in Brighton, MI to help their staff get ready for the spring and summer seasons. In six short hours, we not only cleared, replanted and mulched three flower beds; but we also assembled and stained over 30 picnic tables. Although it sounds like a long day of hard work, with 20 plus workers fueled by pizza and some rockin’ 80’s tunes, the work was light, and time just flew by. And let’s just admit it, no matter how much you love your job, sometimes a day working outside in the sunshine beats a good day in the office! We’re proud to say that we have been doing projects just like these and others for the community since we opened our doors in 2004. It’s just another way we show that we care and that we’re a different kind of collection agency. It’s also a great way for us to bond as a group outside of the office while doing good for others. I am already looking forward to Adopt a Park 2018—it’s a unique opportunity to help the community and have fun at the same time. See you next year ! But before you go, check out a quick video of the day below. American Profit Recovery was one of a handful of great collection agencies that took part in this year’s Collectors Challenge to raise money for some important programs. Money raised through these efforts is put towards the Loomer-Mortenson Scholarship program that helps further the education of those in the collection industry. You can learn more about the program here. You may have an impression of collection agencies that only involves a bunch of people in a dark room making phone calls all day. Not here…We have fun every day and we turn the business of raising money for these program into even more fun. Here’s a few things we did around the office to raise almost $1,800 for these programs. First we held our annual March Madness brackets. And while many companies might do this, a portion of our money goes to this important cause. We also held just about our favorite way of raising money and that’s paying for the option to dress casual in the office. Over the years we have raised a ton of money for all our charitable endeavors through dressing casual. Our third way of raising money was through our egg hunt in the office. Our team hid over 500 eggs in the office and all contained various prizes from candy all the way up to gift cards and other great prizes. And we ended our efforts with a classic putt to win competition in the office. Competitors had to make a 75 foot golf putt across the office and our winner won pizza every week for a month. While helping our clients get paid the money they are owed is serious business, we make sure our team has fun while doing it. Having time to laugh in and out of the office as well as the mission of helping others is what we feel make this a different kind of collection agency as well as a great place to work. The forecast shows on plunge day, there will be a high of 26 degrees. Please come Join American Profit Recovery on Jan 28th at 1:30PM at Brighton High School. You don’t have to take the plunge, just come to support those of us that are. You can also see our surprise costumes. Last year, we were a group of “Where’s Waldo.” The previous year we dressed up as “Oompa Loompas”. I always make sure to attend because of a past teammate of mine who had a disability. He worked harder than anyone else on the team both in the pool and in trying to make us laugh. All he wanted, was to be accepted as a teammate. 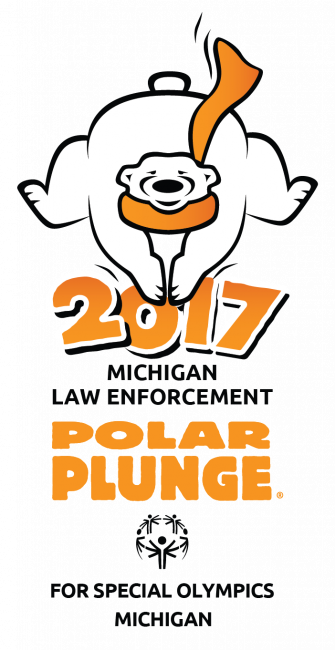 If you don’t leave the warmth of your home to see APR take the plunge, please donate to our team. This year – American Profit Recovery – MI will once again be participating in the Making Strides Against Breast Cancer walk sponsored by the American Cancer Society. 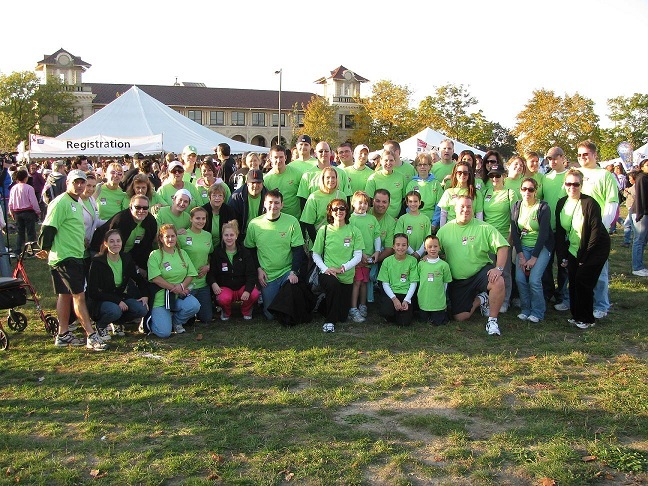 This will be APR’s 8th year participating in this walk. This year APR will be participating in the Making Strides Walk in Detroit, MI on Saturday, October 8th 2016. This is a family friendly event where we encourage everyone to bring their family and friends to be part of Team APR! Our staff and ownership have raised tens of thousands of dollars for this important cause and we continue to make this one of our biggest charity efforts of the year. We welcome anyone would like to get involved to click on the link below to Team APR to donate or even better – JOIN OUR TEAM – and walk and fundraise with us. This is a picture of Team APR a few years back. This was the largest team we had to date – and we are looking to form an even bigger one this year. Join us!